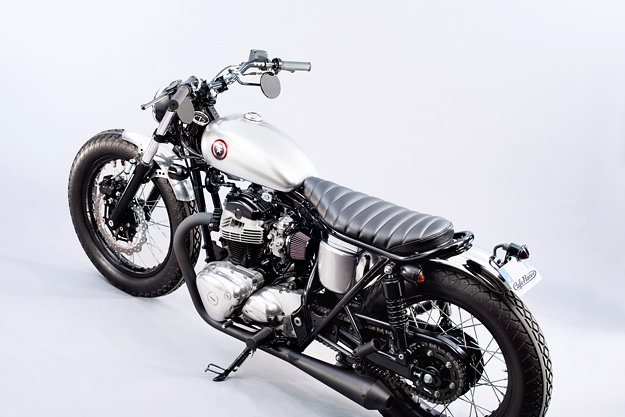 It’s a while since we’ve featured a Kawasaki W650. So it was a pleasure to receive details of this beautifully proportioned build from Bertrand Bussillet, editor of the French magazine Cafe Racer. The W650 belongs to a Parisian actor, David. 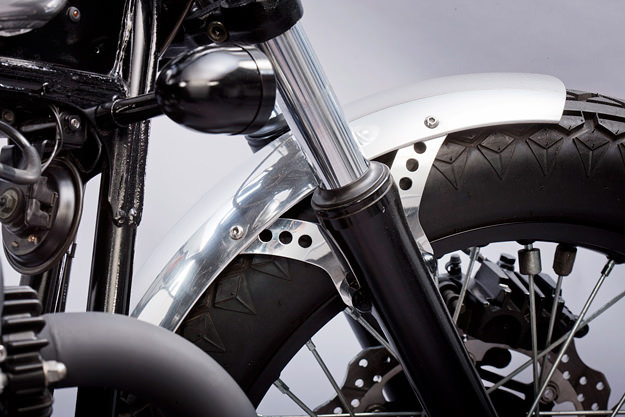 He’s a long-time fan of custom motorcycles; the first bike he bought was from Mecatwin, the Triumph specialist. But when David saw Deus’ Bloodnok, he had a coup de foudre—it was love at first sight. 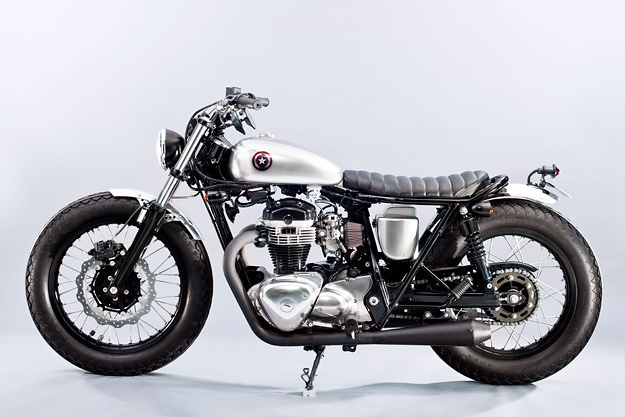 He decided to build his own W650 inspired by the Australian brat-style beauty. David started his project by collecting parts, mostly through two web shops. Webike supplied the aluminum tank, the bars and the Daytona speedo, while Vanem delivered the battery box and the exhaust system. He then bought a 2006-model W650 with very low mileage and in perfect condition. After scouting around for a workshop able to build the project, David selected Max Power in Roncq, northern France. 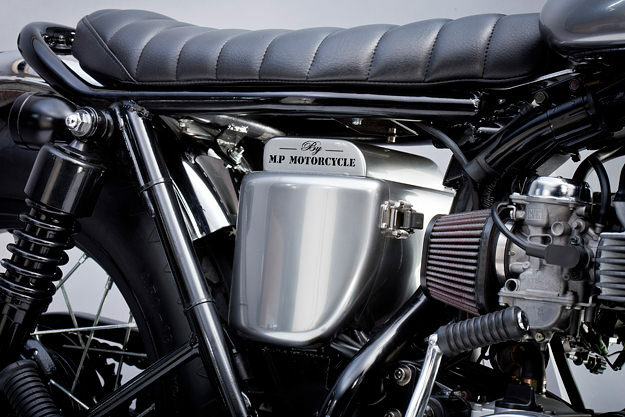 Max Power’s owner Philippe specializes in highly tuned engines and is best known for his muscle bikes. But he also has a great reputation for neat detailing, and that was the brief David gave him—to build a motorcycle as perfect as a factory bike. Max Power worked for three months, redesigning the subframe and creating a support for the battery box. A lot of effort went into the front of the bike, to get it as light as possible. The wiring is now hidden under the tank, and goes through the frame and then the bars; the speedo is on the left side of the frame, with the indicators alongside. The classic-style seat came from Auto-Sieges, and Venom Design applied the immaculate paintwork. It’s one of the cleanest W650s we’ve ever seen. Time to start trawling eBay again for a cheap W650, methinks. 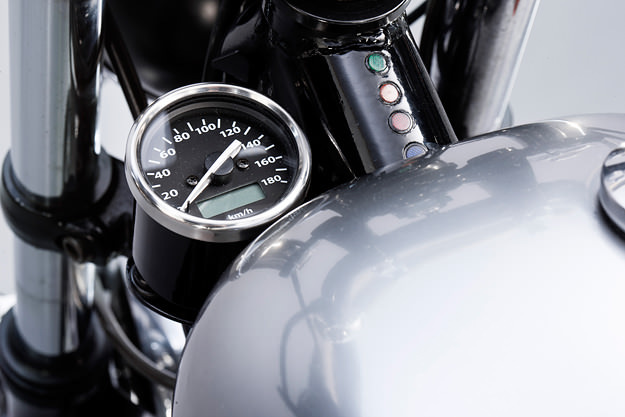 Images by Rob Schoehuys for Cafe Racer.